Elysium is a MIDI sequencer only: it has no sound generation facility of its own. But that makes it an ideal complement to your existing tools and favorite synths; the creator shows it off with Apple Logic Studio (Sculpture physical modeling, anyone?) and Native Instruments Kore. Most sequencers work like a variation on a score: you compose events in time and it renders those events in precisely the same order each time. Elysium is generative: instead of creating a score, you create a system, and events are determined by the rules of the system. That means the exact deployment of events in time is variable, and things may not sound the same way – or over the same span of time – twice. To do this, Elysium employs layers, cells, tokens, and callbacks. Huh? Layers are roughly equivalent to a track in a traditional sequencer; it’s a single grid of cells, each containing a note, transmitted on one MIDI channel. That means, most likely, you’ll use a different layer for each sound you want to generate in your synth or host. 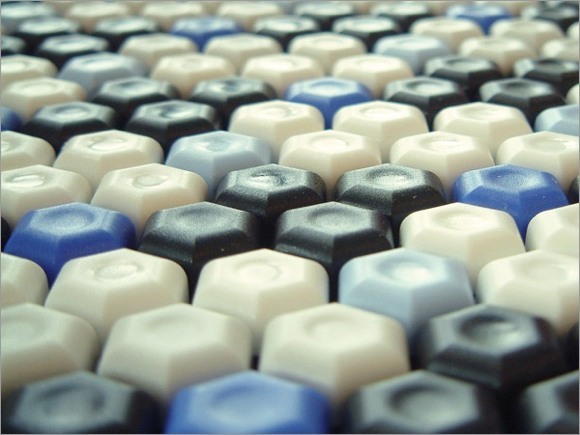 Cells are arrayed in a 17×12 honeycomb (a hexagonal grid), each transmitting one MIDI note. They’re organized in a harmonic table – the three adjacent hexagons around a single vertex, for instance, form a triad. Tokens are the things that actually do stuff – they’re what make Elysium generative and interactive. Functions currently include Start/Stop, Note (plays an actual note), Rebound (changes direction), Absorb, Split, and Spin (impact movement). Arrange these on the grid, and instead of playing left-to-right as a traditional sequencer would, playback will navigate the spaces on the grid – potentially in unusual and interesting ways. To edit tokens, Elysium uses floating inspector palettes for setting parameters. Anyway, the resulting sequencer navigates through musical materials interactively. Add some layers, and you can create something quite dynamic. If that sounds as though it could become monotonous, consider this: you could use Elysium to trigger a sampler as well as notes on a synth, and you could modulate a synth’s timbres while Elysium drives notes. There’s some serious potential. Elysium: Probabilistic Arp from giles goat boy on Vimeo. There’s a separate hands-on employing Ableton Live, by mmi. Adjacent tiles can be described as defining a vertex (a point) or a whole edge, and you still get the same number of tiles – six. On a grid of squares, there are only four squares that are adjacent based on side (the ones above, to the right, to the left, an below), but eight squares sharing a vertex (the ones on the diagonal). That makes navigation through the grid somewhat confusing – though it does enable the games of chess and checkers. The distance from one tile to an adjacent tile is the same, whichever direction you go. This comes up in game design because hexagonal grids work well for mapping movements of … well, little dudes fighting in strategy games. The advantage is the inverse of what you get in checkers and chess: you can define one kind of movement from a tile to an adjacent tile. orm neat little triads and dyads that can make sense harmonically when we’re talking pitch. At the same time, these seem advantages pose some challenges. The hex grid is so regular, it’s a little hard to look at. There’s a reason pianos use keys of different sizes and colors. It would be possible to use clever coloring schemes to help with this, though the shape would remain regular (and thus a little hard to look at). Elysium does have a color scheme applied, but it certainly requires some adjustment; perhaps the ability to shift on-the-fly to see pitch relationships could help. I do also wonder if there aren’t ways of using these kinds of grids aside from just putting a note on each tile. Elysium does have more going on, but you can’t see it. It’s all hidden behind the tiles in scripts and slightly hard-to-recognize icons. It’d be great to see more visual representation of movement and interaction. This app is new, so perhaps there’s still time. That said, I think the capabilities here are already amazing. I was a skeptics of hexagonal grids when I first saw them, feeling as though I’d just been dropped on an alien starship. (Greetings, fellow Cardassians!) But there is something behind the geometries we use. And I have no doubt that a lot of future experimentation with sequencers will involve more than just grids that read, as piano rolls and notation once did, in linear fashion from left to right. Nodal, like Elysium, is Mac only, free, and uses a graphical interface to create interactive rules. Interestingly, it uses square grids to Elysium’s hex grid and provides schematic-like flow diagrams of movement. Each approach, I think, has some advantages and tradeoffs. Kodu by Microsoft Research uses interactive rules for game design, not music, but I can see the interface working well for musical applications, too. What really makes it work is that you have immediate visual feedback as to what you’ve created, which makes the kid doing the driving very pleased, indeed. Intermorphic’s own generative suite draws upon a lineage that includes Eno’s landmark Ambient Music I. It’s far less graphical,but can be used to create sophisticated systems, interfaces with mobile devices, and provides deployment options (so other people can hear your generative work and not just a recorded take). And be sure to check out the generative tag on CDM. For a hardware device using this scheme (and with a nice solution to the color / mapping challenges), check out the C-THRU Axis.